Around 635 to 720 million years ago, during Earth's most severe glacial period, the Earth was twice almost completely covered by ice, according to current hypotheses. The question of how life survived these "Snowball Earth' glaciations, lasting up to about 50 million years, has occupied the most eminent scientists for many decades. An international team, led by Dutch and German researchers of the Max Planck Society, now found the first detailed glimpse of life after the "Snowball' in the form of newly discovered ancient molecules, buried in old rocks. "All higher animal life forms, including us humans, produce cholesterol. Algae and bacteria produce their own characteristic fat molecules." says first author Lennart van Maldegem from Max Planck Institute (MPI) for Biogeochemistry, who recently moved to the Australian National University in Canberra, Australia. "Such fat molecules can survive in rocks for millions of years, as the oldest (chemical) remnants of organisms, and tell us now what type of life thrived in the former oceans long ago." But the fossil fats the researchers recently discovered in Brazilian rocks, deposited just after the last Snowball glaciation, were not what they suspected. "Absolutely not," says team-leader Christian Hallmann from MPI for Biogeochemistry, 'we were completely puzzled, because these molecules looked quite different from what we've ever seen before!" Using sophisticated separation techniques, the team managed to purify minuscule amounts of the mysterious molecule and identify its structure by nuclear magnetic resonance in the NMR department of Christian Griesinger at Max Planck Institute for Biophysical Chemistry. "This is highly remarkable itself' according to Klaus Wolkenstein from MPI for Biophysical Chemistry and the Geoscience Centre of the University of Göttingen: "Never has a structure been elucidated with such a small amount of such an old molecule." The structure was chemically identified as 25,28-bisnorgammacerane—abbreviated as BNG as van Maldegem suggests. Yet the origin of the compound remained enigmatic. "We of course looked if we could find it elsewhere' says van Maldegem, who then studied hundreds of ancient rock samples, with rather surprising success. "In particular the Grand Canyon rocks really were an eye-opener' says Hallmann. Although nowadays mostly sweltering hot, these rocks had also been buried under kilometres of glacial ice around 700 million years ago. 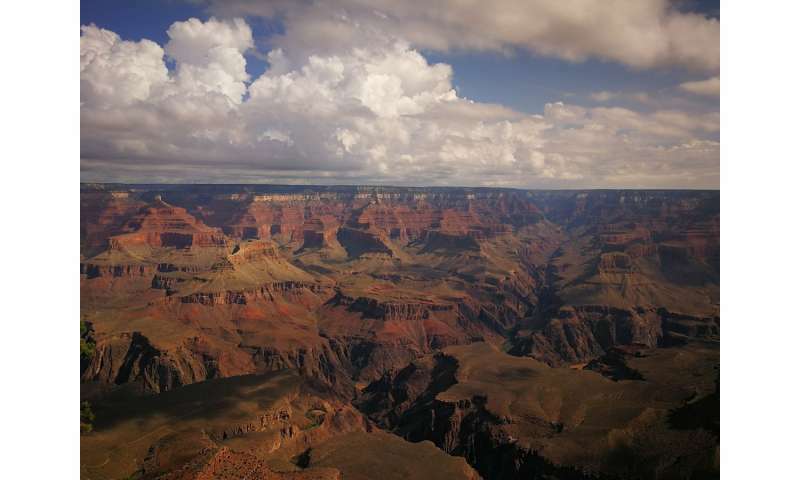 Detailed additional analyses of molecules in Grand Canyon rocks—including presumed BNG-precursors, the distribution of steroids and stable carbon isotopic patterns—led the authors to conclude that the new BNG molecule most likely derives from heterotrophic plankton, marine microbes that rely on consuming other organisms for gaining energy. "Unlike for example green algae that engage in photosynthesis and thus belong to autotrophic organisms, these heterotrophic microorganisms were true predators that gained energy by hunting and devouring other algae and bacteria' according to van Maldegem. While predation is common amongst plankton in modern oceans, the discovery that it was so prominent 635 million years ago, exactly after the Snowball Earth glaciation, is a big deal for the science community. "Parallel to the occurrence of the enigmatic BNG molecule we observe the transition from a world whose oceans contained virtually only bacteria, to a more modern Earth system containing many more algae. We think that massive predation helped to 'clear' out the bacteria-dominated oceans and make space for algae' says van Maldegem. The resulting more complex feeding networks provided the dietary requirements for larger, more intricate lifeforms to evolve—including the lineages that all animals, and eventually we humans, derive from. The massive onset of predation probably played a crucial role in the transformation of our planet and its ecosystems to its present state.